To all our wonderful CSA Members – and newsletter subscribers, too, I apologize for being 24 hours late on this. Sometimes there just aren’t enough hours in the day. We had a big day at the Poplar Grove Herb & Garden Fair last Saturday and Sunday and we added quite a few new CSA members and newsletter subscribers. We are now expanding the service all the way up to Topsail, so if there are any new newsletter subscribers up that way, please feel free to sign up. We would love to have you. If the Poplar Grove Herb & Garden Fair was any indication of what the Farmers Market at Poplar Grove is going to be like, then it’ll be a banner year. I give all the credit to the market managers, Suzette Cooper-Hawley and her husband Jackie. 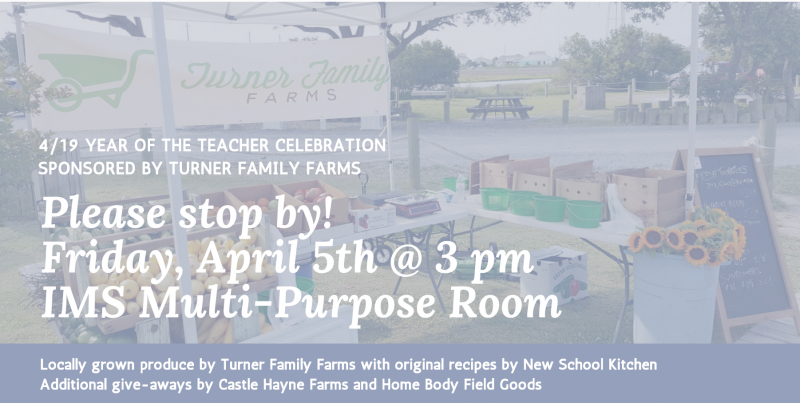 Turner Family Farms will be at that farmer’s market every Wednesday beginning April 4th. I’ll be revamping our calendar on the website tomorrow, but I wanted to let everyone know that Ian and I will be with our awesome CSA member, Elizabeth Crawford, supporting Island Montessori School teachers tomorrow. I know teachers – my mother was a fantastic teacher – and they are a lot of fun. I’m sure there will be pictures and a TFF blogpost about this event over the weekend. ABOUT THE BOX – How about those carrots! That’s a new (to us) variety of carrots that are named “Hercules.” Jessicca calls them “Bugs Bunny carrots” because they are shorter and fat, and very tasty. We also have collards this week. 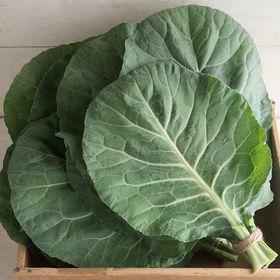 These are what country folks ruefully call “kale-collards,” as opposed to the much larger, cook-to-death-with-a-ham-hock-until-the-whole-house-stinks kind of collard preferred by us rednecks. The truth is, I love these smaller ones. They are terrific for making cooked and uncooked wraps. There is some arugula this week, and turnip roots, too – more below on those. 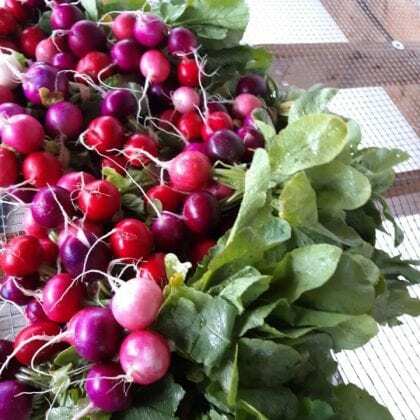 This week we have the terrific new salanova salad mix, radishes with tops (don’t forget to eat the greens!,) arugula, sweet potatoes, carrots with tops, collards, rainbow chard, and some turnip roots. Spring has sprung which means we will be having nice squashes, cucs, and tomatoes very soon! Collards. Another terrific Brassica well-known throughout the South, though, like it’s kale cousin, it grows very well in Northern climes, too. 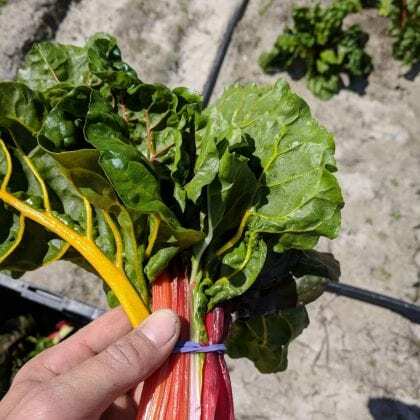 It’s an interesting plant from a farmer’s standpoint because it can be harvested at many different stages from baby leaves, to mid-size leaves like the ones we grow, and all the way up to large heads. They also make a great microgreen. As far as cooking these particular collards. If you want to try something most people wouldn’t think of, just par-boil the larger leaves quickly and make wraps out of them like this. For a unique hot preparation, I say go with our (CSA member) Elizabeth Crawford’s Coconut Curried Collards from our own TFF blogpost here. 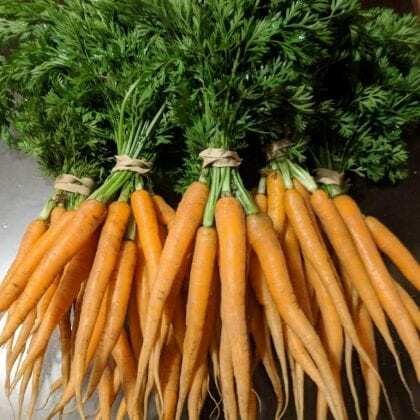 Carrots with tops! Carrots are in the Apiaceae family along with celery, parsnip, dill, fennel, coriander, chervil, cumin and parsley. 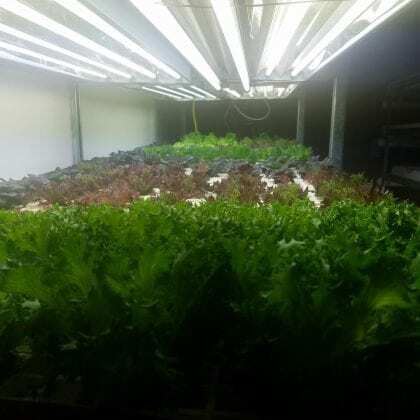 It’s not the easiest crop to grow as it takes a long time to germinate and we need to create weed free beds in which to plant them, otherwise the weeds take over before the carrots have a chance to get established. Once you get it figured out, growing carrots is very rewarding. We grow several varieties including Napoli, Yellowbunch, Malbec, Purple Haze, Mokum, Hercules and Romance. Arugula Also known as “Roquette,” is in the Brassica family but has a character all it’s own – as well as a genus to itself as far as I know – Eruca (sativa.) From the farmer’s perspective, it’s a short season, cool season crop. It can be grown in the warmer months but it bolts quickly and with the flowers comes a lot of spicy heat. We get several cuttings of baby-ish size leaves throughout the spring, fall and even winter under low tunnels. 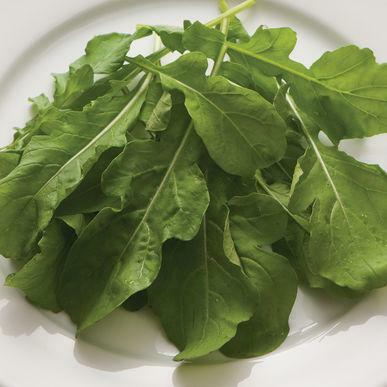 From a culinary perspective, arugula is nutty and spicy at the same time. It can be wilted (very briefly) like spinach, but I think it’s better in salad mixes or as a stand-alone salad with a slightly sweet dressing like this one Tyler Florence recommends. I really like this one myself. Simple is always better in dressings. Purple Top White GlobeTurnip Roots Another Brassica but in this case we are just talking about the root. 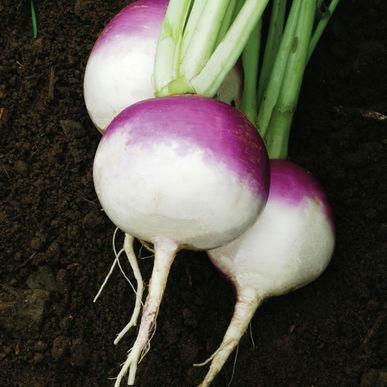 Turnips are interesting from a grower’s standpoint in that they are self-thinning in the row, meaning, it’s nearly impossible to plant them too close together. That’s a good thing because the seeds are tiny, though, our Jang Seeder singulates them very well. We will have more later on Asian salad turnips as they come into harvest. I know people that will eat our fresh turnips like an apple, but most people roast (bake) them after cutting them into half inch cubes. I’ve been known to add turnips and carrots to my rustic mashed potatoes. 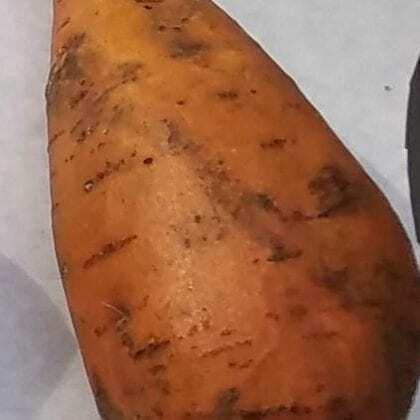 Here’s a whole slew of good ways to use turnip roots from allrecipes.com.